With the Kamira research project that I am leading, our team was able to instrument the Meaningful Use (MU) Stage 2 Clinical Quality Measure (CQM) logic with the procedural logic for calculating the results of the CQMs via the popHealth project. What this popHealth CQM calculation software provided the Kamira team was the clinical building blocks of the CQM logic, which we were able to marry with publicly available claims data hosted by CMS based on de-identified real-life claims records. With the CQM calculation land this collection of claims records, we were able to asses ranges of the cost associated with addressing the MU Stage 2 CQMs. With this, we were able to provide a guess for how much cost would be introduced into the healthcare system if a provider were to attempt to address the numerator logic of an MU Stage 2 CQM. Procedural numerator logic for "NQF 0062: Diabetes Urine Protein Screening"
As a non-clinician, the first two tests in the numerator logic make sense to me (microalbumin lab tests). They appear to be in the "spirit" of this CQM, measuring if the provider has performed the microalbumin lab test for kidney damage. 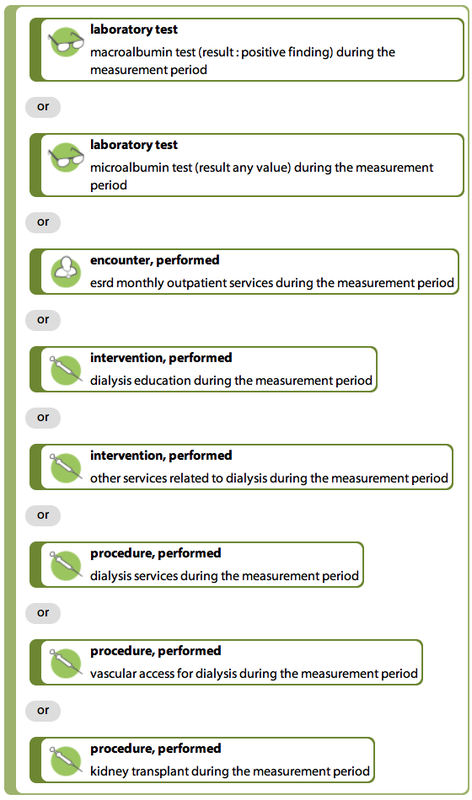 However, the Kamira automated cost assessment highlighted that the vascular access for dialysis is clearly a much more expensive procedure to address this numerator logic than the lab test. We didn't have any claims data on the kidney transplant from our sample set, but I can only speculate that the cost for that claim would be in the six figure range. Looking purely at the CQM logic, and not applying any clinical perspective on this CQM, the vascular access for dialysis procedure is viewed as equivalent to the microalbumin lab test, at least within the scope of in this CQM logic. Both are equal when assessing if the provider is performing the best quality of care for their population of diabetic patients. Again... a kidney transplant is also in that same category as being semantically equivalent to the microalbumin lab test!!! 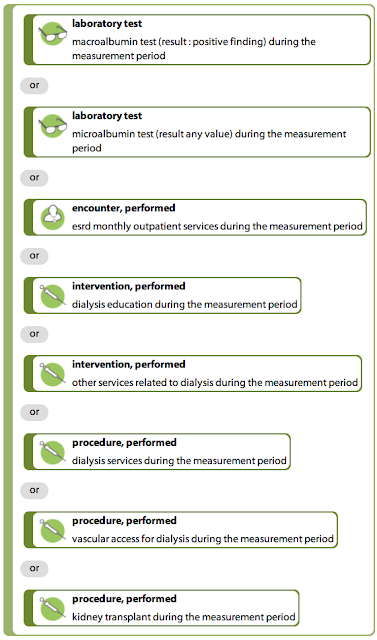 On the flip side, it appears to me that vascular access for dialysis is meant to address a known clinical problem, whereas the microalbumin lab test is designed to only collect and present information to a provider. This difference in the clinical purpose of the clinical activities is not considered in the CQM logic. Again, the CQM logic views both as equivalent when measuring the quality of care that a provider is applying to their population of patients. 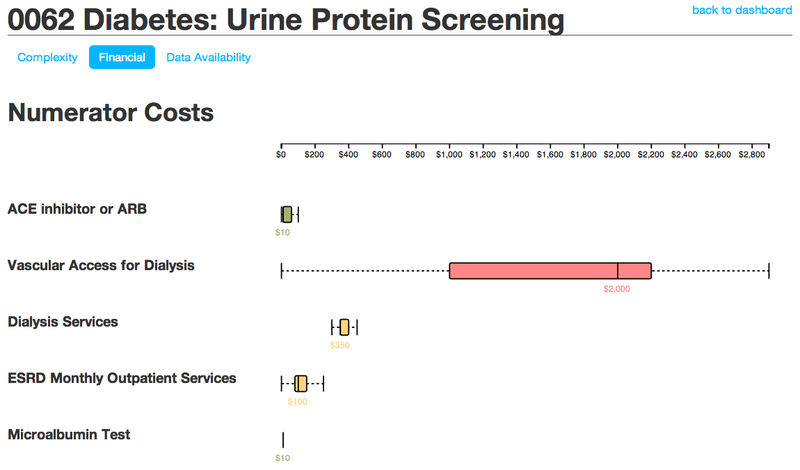 Based on the Kamira automated CQM cost analysis, my recommendation is to groom the logic of "NQF 0062: Diabetes Urine Protein Screening", and re-position the dialysis procedure probably belongs in the exception or exclusion logic, vs. the current numerator logic. There are some additional opportunities to apply this cost consideration on all Meaningful Use Stage 3 CQMs. By applying these cost metrics to the MU Stage 3 CQMs, at minimum, the policy makers could discuss the impact of cost with the numerator logic clinical data. Additionally, these conversations could potentially lead to streamlining and pruning the MU Stage 3 CQM logic to avoid noisy and high variance healthcare costs within the logic of one CQM.